The "Urban Jungle" wall from Americae is popping up all over the U.S., starting with Philly. In a city known for its murals and sprawling mosaics, tourists and locals alike have taken a liking to spotting particularly Instagrammable backdrops and posing with them indefinitely. As the social media platform ever expands, marketers have caught on, giving rise to this summer's renaissance in Instagram-specific pop-up attractions. Perhaps this mission is most clearly stated with the five-room pop-up exhibit heavily influenced by local muralist Amberella's work, Photo Pop Philly. The exhibit, initially planned to run just from its Memorial Day opening through the beginning of July, has since been expanded to Labor Day. The draw? Each room is adorned with walls specifically curated so visitors can make some pretty content for their Instagrams. Photo Pop Philly isn't alone in this concept. Earlier this month the 18th & Walnut entrance to Rittenhouse Square was adorned with a stand-alone wall created by artist Chris Uphues called #LoveLOFT Good Vibes Only Wall. With a #LoveLOFT hashtag in the corner of the colorful mural, its target function was pretty clear. And now, this week, yet another pop-up wall will join the trend. At the cross-streets of Chestnut and Juniper in front of the Hale Building, the inaugural location of Americae's Urban Jungle: Pop-Up Edition will be on display and smartphone ready. In light of weather reports, the event (originally scheduled for Wednesday) has been pushed to Thursday, July 26. Americae, a new Philadelphia-based womenswear brand, is installing the "urban jungle" wall throughout different U.S. locations for one day at a time, only available in Philly from noon to 8:00 p.m. 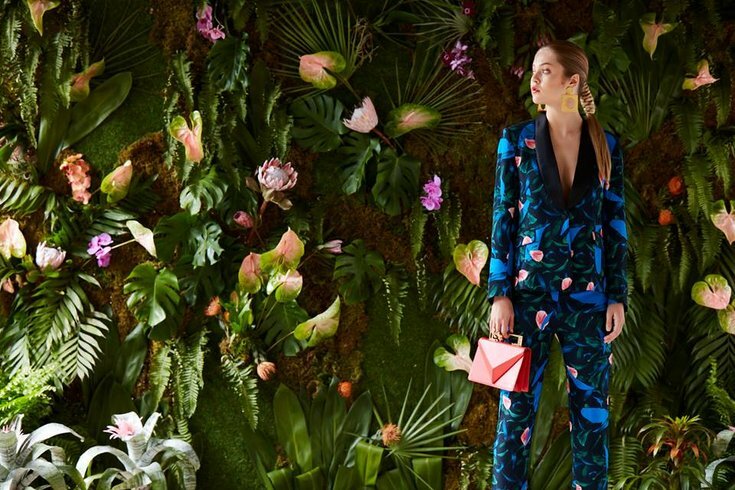 The flower wall is inspired by the Amazon Rainforest, meant to reflect the brand's Latin American influence. The Facebook event description describes it as "the PERFECT Instagram-worthy backdrop," because that's all that matters, right? As the summer goes on and the city's seasonal pop-ups endure, it seems that every seasonal feature -- from the glowing shrubbery at Spruce Street Harbor to the ever-expanding offerings at Eakins Oval -- have some aspect of Instagram-ready fodder to them. For those of you constantly on the hunt for that key aesthetic, here is your next destination.